Trained as a carnivore biologist and quantitative ecologist, my work focuses on carnivore-livestock conflict mitigation. 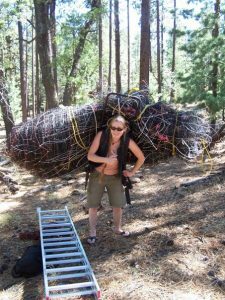 I spent several years studying carnivore species in a variety of land use settings across the American West before starting my graduate work in Environmental Studies at U.C. Santa Cruz, which focused on anthropogenic impacts on mountain lion behavior and ecology. As a grad student and since graduating, I have been working locally and nationally to help livestock producers manage their operations using tools and methods that keep livestock safe, concurrently protecting carnivores as well. As a postdoc in the Macaulay Lab, my work will continue to focus on human wildlife conflict mitigation research and extension. Please email me if there’s anything I can do to help you keep your livestock or companion animals safe.